This is why I love firearms instruction with someone who has never fired a gun before. It gives me a blank canvas to instill in them good habits before they even pull the Trigger. As with many things tactical, if you ask 10 “operators,” you will likely get 10 different opinions on what’s best. I teach the Isosceles technique, which is used by a vast number of special ops forces. It’s the most stable, aggressive and ideal method for firing while moving. Grab your handgun with your dominant hand. Ensure the web of your hand is centered on the rear of the grip. DO NOT gorilla grip/white-knuckle your handgun. This is not necessary and will affect your accuracy. Bring your other hand in front of the grip hand and overlap your fingers. Stack your thumbs with your grip hand thumb on top and point them toward your target. Push forward slightly with grip hand while pulling back slightly your forward hand. Greater stability is achieved by using these opposite pressures. “Index” your trigger finger. This means your trigger finger should be off the trigger, pointed forward and resting on the trigger guard. Put your finger on trigger ONLY when you are ready to shoot. Once you’ve got a good grip, fully extend both arms and roll your shoulders in toward your neck. If done correctly you will create an even triangle from hands to shoulders and across chest (hence “Isosceles technique”). Your body position should be aggressive. This begins with your shoulders rolled forward. Give your upper body a slight forward lean. Your feet should be even and slightly wider than your shoulders. Squat slightly so your knees are bent and you are approximately 4 inches lower in height than when you’re standing up straight. If you are doing this right, you should be able to maintain an aggressive firing position even if you are pushed. If you lose your balance or fall, you need to increase your forward lean. Ensure proper technique by having someone push you. ENSURE YOUR HANDGUN IS UNLOADED. TRIPLE-CHECK YOU HAVE A CLEAR AND SAFE WEAPON: MAGAZINE REMOVED, CHAMBER CLEARED, SLIDE LOCKED OPEN AND CHECKED BY AT LEAST TWO PEOPLE. Center the front site and align it with the rear site. Place the sites over the intended point of penetration on your target. Your focus should be on the front site — NOT on the target. Now that you have the proper technique and a good foundation for effective handgun shooting, the key to accuracy is ALL about your trigger squeeze. 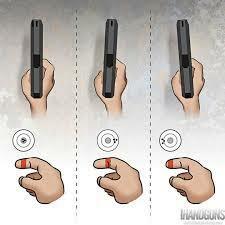 Proper trigger finger position is the middle of the first pad of your index finger. 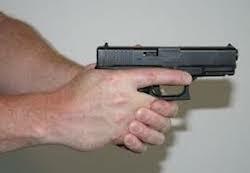 You can practice this by dry firing (going through the above with a CLEAR AND SAFE handgun and no ammo in the area). A great way to gauge if your trigger pull is smooth is to balance a quarter on the end of your barrel. It should not fall off after you have pulled the trigger. Once you are ready to start shooting, if you find you are not firing in a tight group, take a moment to ensure proper overlapping grip, stacked thumbs, extended arms, rolled shoulders and body position. If these are all correct, then it’s right back to working on smooth trigger control. The post SEAL Sniper Reveals Shooting Essentials appeared first on Laissez Faire.